Sparky’s shiny shoes sparkle in the sunshine. Miss Coco Peru has been a household name in the LGBT community for more than 25 years, and she's bringing her talent to Spring Diversity Weekend April 5-7. Peru will headline her show The Talented Miss Coco Peru on Saturday, April 6, at The Auditorium. Jay Wilks, who works with Out in Eureka, said he's excited to bring Peru to Eureka Springs. Peru got her start in the early 90s as a downtown favorite in New York and has since enjoyed an expansive career, Wilks said, from intimate cabaret stages in New York and LA to television sets in millions of living rooms. She has guest starred on Will and Grace, How I Met Your Mother and Arrested Development, Wilks said. "We're kicking the year off just right. I'm really excited about the progress we've made over the years," Wilks said. "Now we have Coco Peru, and we've had Jimmy James and Del Shores perform in town." The weekend kicks off with a meet and greet at Brews from 5 p.m. to 8 p.m. Friday, April 5, followed by Diversity in the Park on Saturday morning and afternoon. Wilks said Diversity in the Park starts at 10 a.m. and lasts until 4 p.m., with performances from Johai Kafa, Fossils of Ancient Robots and Jessamyn Orchard. "We're bringing in some big headliners," Wilks said. "It's going to be really neat, because this year it's all local music. All these musicians coming in are really local. They're well-known around here. They'll keep the crowd going." He continued, "People will be able to come mingle in the park, dance to Johai Kafa and take a break for lunch –– or they can just stay in the park all day." Another exciting part of Saturday's events, Wilks said, is how many vendors show support for the LGBT community in the park. This year, he said, the Arkansas PTA will stop by. Wilks explained that the statewide PTA organization is having its annual conference the same weekend as Spring Diversity. "One of the things the PTA is doing here in Arkansas is promoting more awareness about the LGBT community in the school system," Wilks said, "and working with parents and kids in public schools. They're going to be here in the park to let people know, 'We're the PTA, and we're here for your kids.'" Pop culture artist Trevor Wayne will be in town during the weekend too, Wilks said. Wayne, who is known for depicting famous pop culture figures like the Golden Girls and Marilyn Monroe, will premiere limited edition prints and mugs honoring Peru. Wilks said the prints and mugs will only be available during Diversity Weekend, saying the items will be sold at The Auditorium during Peru's performance and at an artist's reception from 1 p.m. to 5 p.m. Sunday, April 7, at Zarks Gallery in downtown Eureka Springs. "The prints and mugs are specifically for Eureka Springs for Diversity Weekend," Wilks said. "That's very special to us. We're really excited about it." Out in Eureka has been working with businesses in town to welcome everyone during the weekend, Wilks said. "Those partnerships are great. More and more businesses want to be involved because they're seeing an increase in traffic," Wilks said. "Some are sponsors for Coco Peru, and some of our businesses do wristband discounts. They love that, because it's no cost to them but it encourages people to stop by their stores when they offer a discount or special item." When everyone works together in Eureka Springs, Wilks said, it sends a positive message to visitors near and far. Wilks said he loves how LGBT couples can come to Eureka Springs and completely be themselves without fear. "People who come here know they can go into any restaurant or shop. They can hold hands," Wilks said. "They can go to a venue or a coffee shop. They can stay in a hotel or bed and breakfast and not feel endangered." The city has done a good job marketing itself as LGBT friendly, Wilks said, and that's because it is. "It's really cool, because people can come in and be who they are. They can have a good time and be safe," Wilks said. "They know that when they go into businesses, they are just as loved as anybody else." Wilks encouraged everyone to visit Eureka Springs, saying he loves seeing visitors all times of the year. "Come to Eureka Springs because it's beautiful. It's full of history," Wilks said. "We have a great art scene, a great food scene, and when you come to town, you're going to feel the love from everybody here." He continued, "You can come feel safe here. People really feel the love here. Come for the beauty, the architecture –– come for everything, but especially because you will feel safe at any time, and not just during Diversity Weekend. 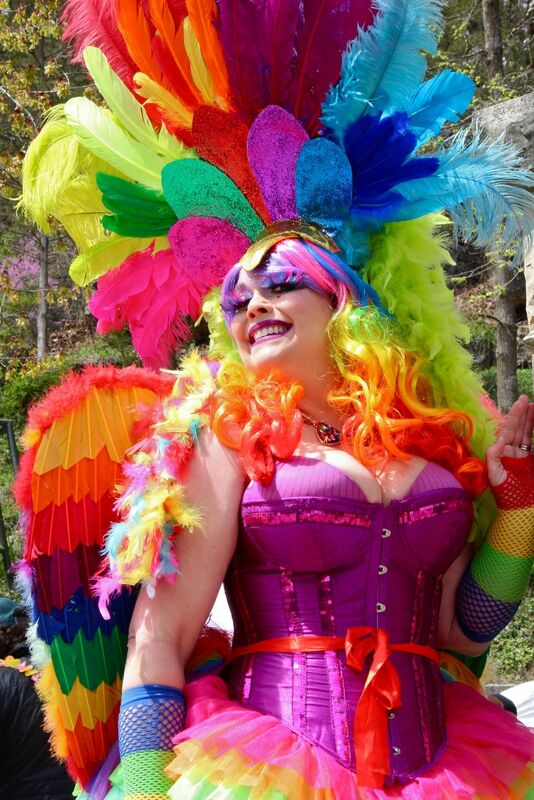 Daylight Drag Shows in Basin Park are a new addition to Eureka’s Diversity Weekends.